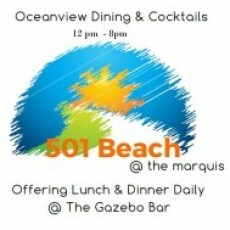 Cape May’s Hidden Gem, 501 Beach @ the marquis is located on the first floor of the Marquis de Lafayette Hotel. Our spacious 180 seat dining room and full service bar is home to our famous all-you-can-eat breakfast buffet and a-la-carte dinner. For a change in pace, dine and enjoy cocktails outside for lunch or dinner at the Gazebo Bar. It is open to the public for everyone to enjoy! Reservation are recommended for parties of 5 or more. Busses and groups are welcome! To make a reservation call 609.884.3500 (option 2).